Two bestselling books ... two times the delight in this collection of classic Adrian Plass. 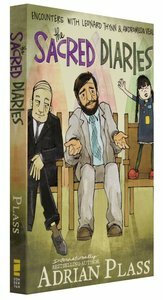 Million-selling author Adrian Plass takes us on a rollicking tour of the 'Sacred Diarist's' slightly surreal world. From the pugnacious Andromeda Veal to the loony, loveable Leonard Thynn, the whole gang is here in full glory, bound for misadventure, loads of fun and the occasional insight neatly camouflaged as side-splitting humour. The Horizontal Epistles of Andromeda Veal Budding young Christian feminist Andromeda Veal has broken her femur and now lies in traction. But she's still entirely capable of composing correspondence to such individuals as Margaret Thatcher and God. And of responding in her own inimitable style to the letters she receives from Adrian's wife and fellow churchgoers. The Theatrical Tapes of Leonard Thynn The single, lateral-thinking and probably alcoholic Leonard Thynn takes it upon himself to document the rehearsals of the church play. And if suffering produces character, Plass, the chair of the play, ought to reap integrity by the truckload as he contends with the likes of Thynn, Percy Brain, Victoria Flushpool, Vernon Rawlings and other unforgettables. About "The Sacred Diaries Encounters With Leonard Thynn and Andromeda Veal"